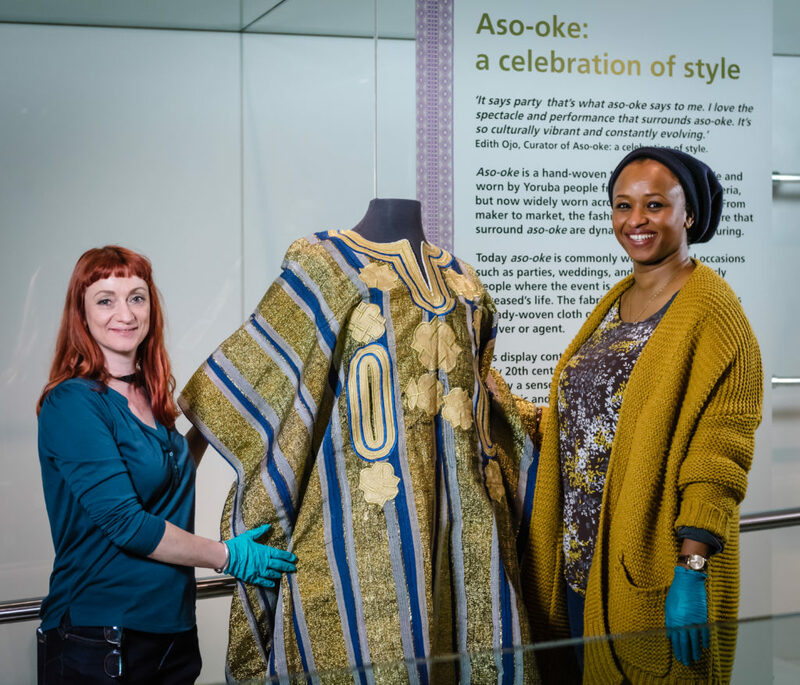 Brighton Museum & Art Gallery are presenting two new displays: Aso-oke, a Celebration of Style & Townships Journeys Displays. Co-curated with researchers from the African diaspora who live in Sussex, they highlight the rich and evolving fashion and identity practices in Africa. These displays are part of Object Journeys Fashioning Africa project and supported by the British Museum. 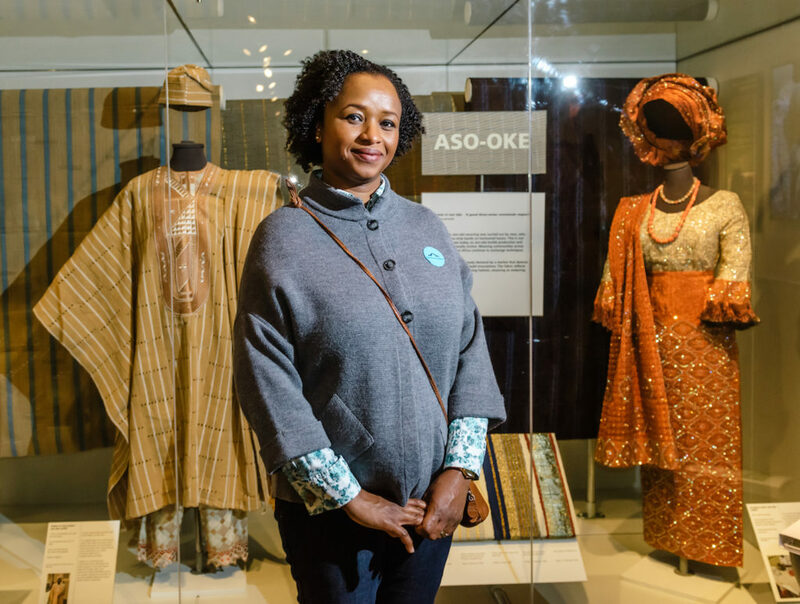 Curator Edith Ojo in front of ‘Aso-oke, a Celebration of Style’ display case. ©Royal Pavilion & Museums, Brighton & Hove. Photographer James Pike. 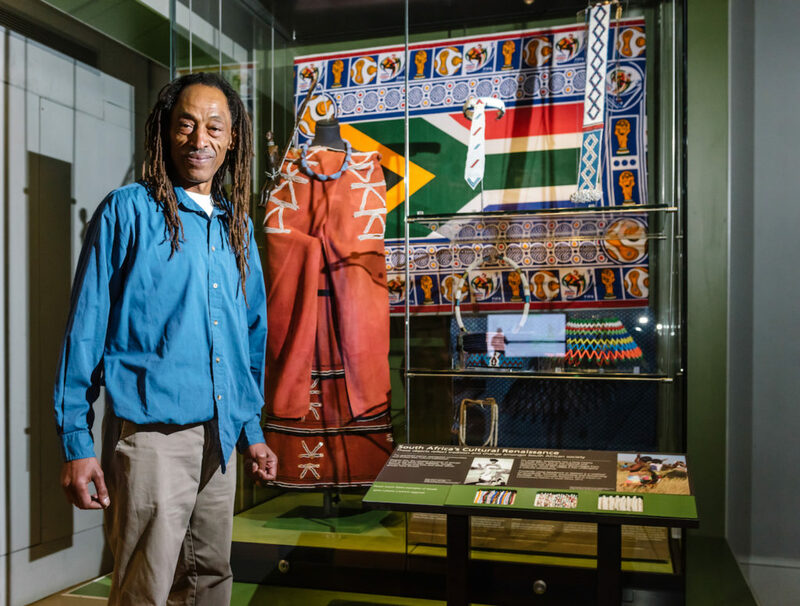 Curator Tshepo Skwambane in front of a ‘Township Journeys’ display case. ©Royal Pavilion & Museums, Brighton & Hove. Photographer James Pike. 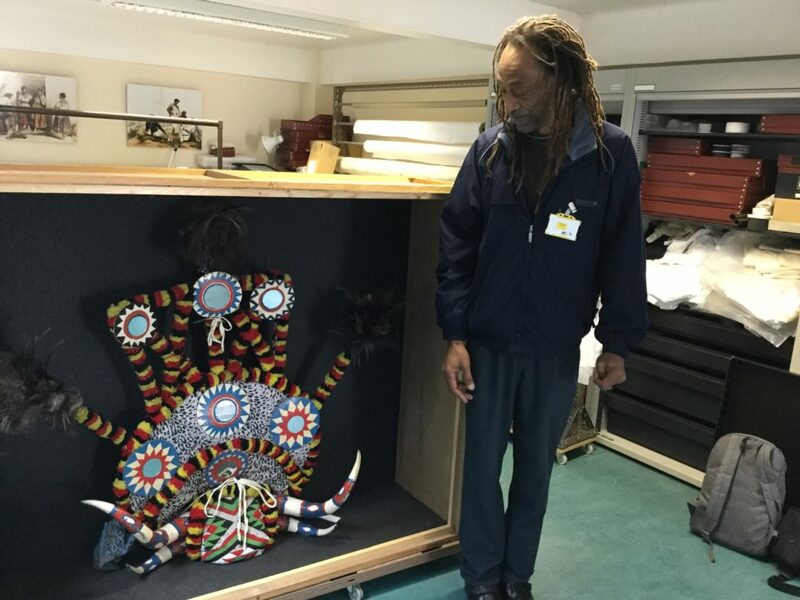 The process: The displays have been co-curated by Edith Ojo, Tshepo Skwambane and World Art Collection staff at Brighton Museum & Art Gallery with support from British Museum Curatorial, Learning and Conservation staff. Through the process of co-curation, Edith and Tshepo have shared their cultural knowledge, expertise and experiences of growing up in Africa, to provide new interpretations for the displays and to breathe new life into historic African object. 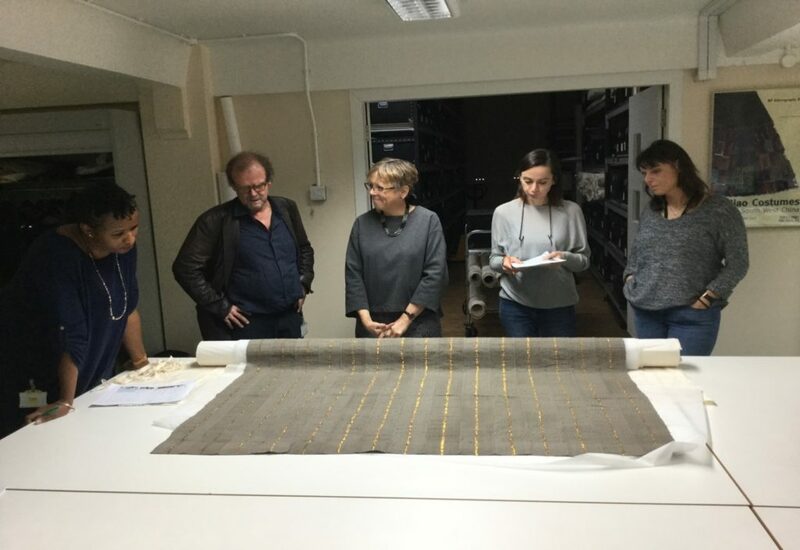 Tshepo and Edith search The British Museum collections database with BM Textiles Collection Manager Helen Wolfe, Helen. M and Kayte. ©Royal Pavilion & Museums, Brighton & Hove. 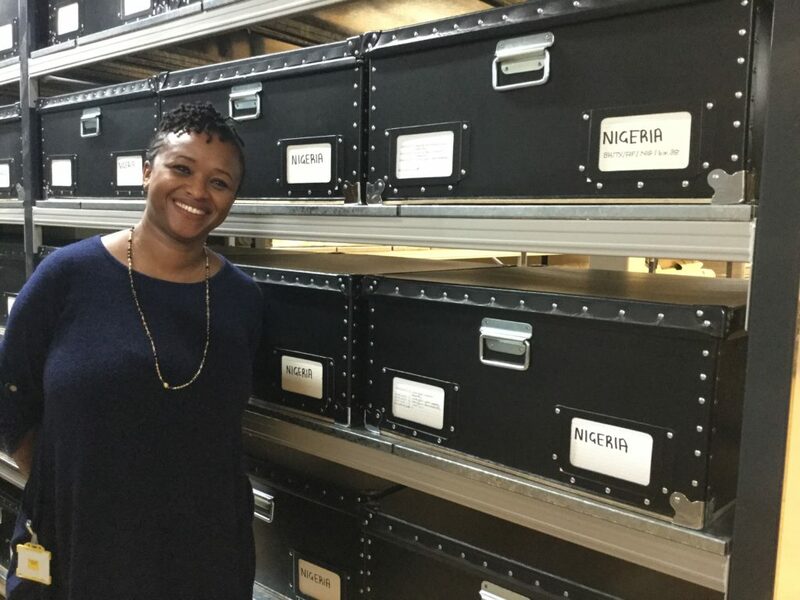 Edith researching the Nigeria collections in the stores at The British Museum. ©Royal Pavilion & Museums, Brighton & Hove. 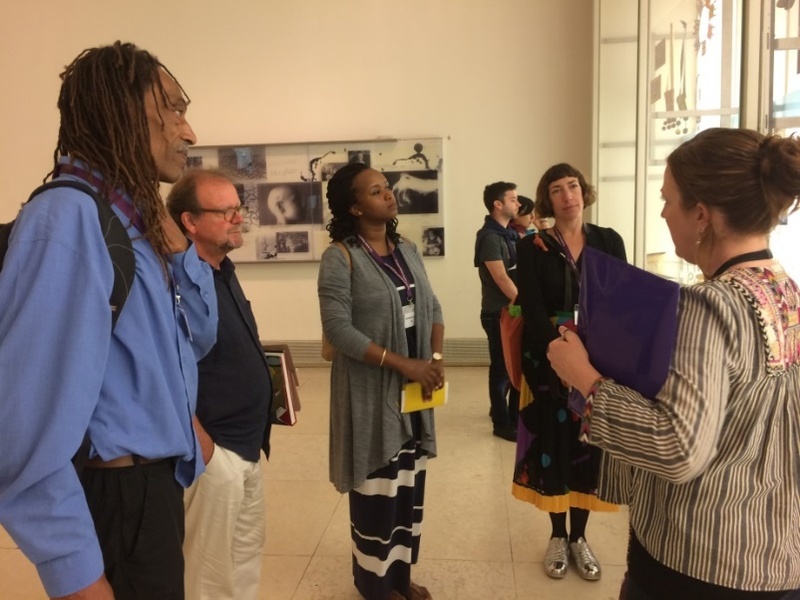 Edith, Tshepo and the museum team visited the British Museum several times over the summer of 2017, to meet British Museum curators, find out more about the other Object Journeys projects the British Museum were running and to choose objects to go on loan to Brighton Museum as part of their displays. Edith and British Museum staff discuss possible object inclusion in the Brighton displays. ©Royal Pavilion & Museums, Brighton & Hove. 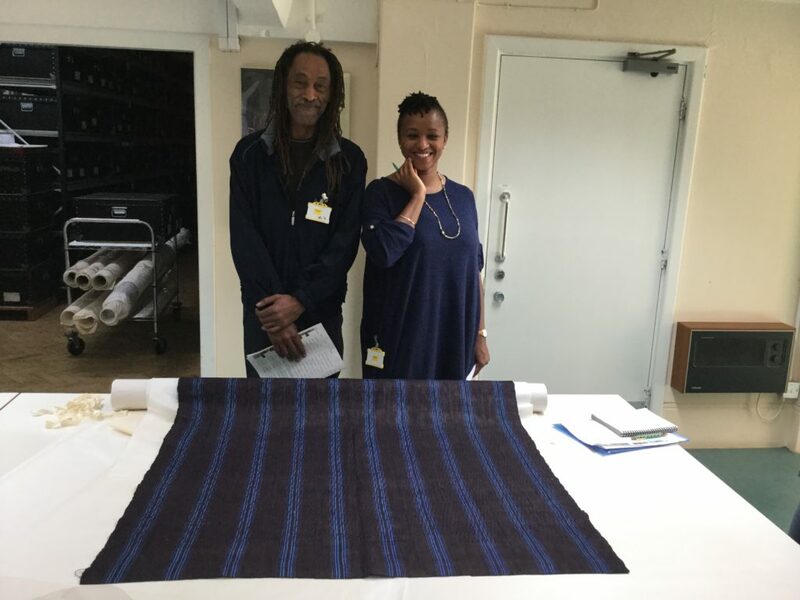 Edith, Tshepo, view an aso-oke textile for possible inclusion in the Brighton displays. © Royal Pavilion & Museums, Brighton & Hove. 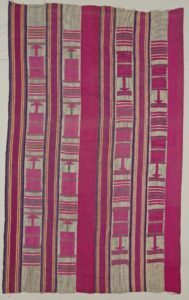 On display are post 1960’s textiles and garments collected as part of the Fashioning Africa project, earlier historic African textiles and bead-work from Brighton Museum’s collections and objects on loan from the British Museum. 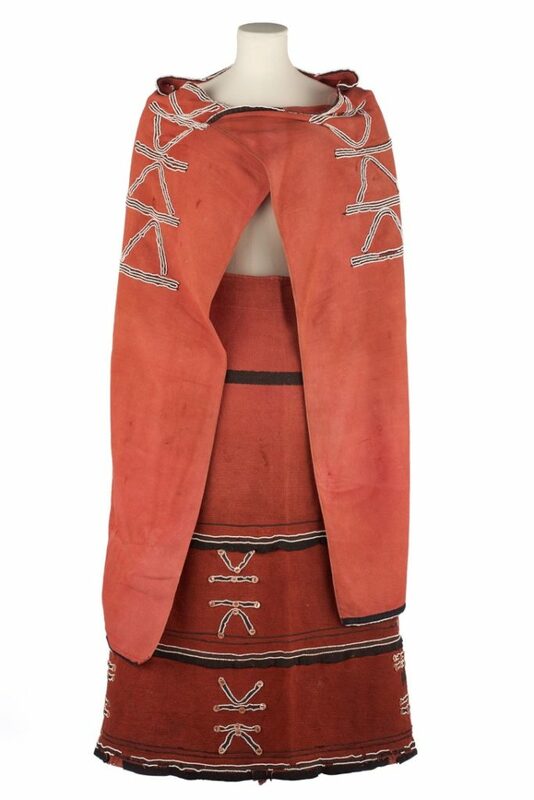 Xhosa woman’s outfit, c.mid 1900s. 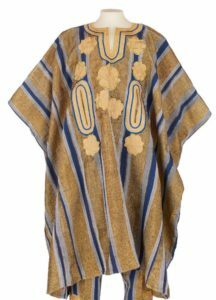 Donated to Brighton Museum for the Fashioning African project in 2016. ©Royal Pavilion & Museums, Brighton & Hove. Photographer John Reynolds. 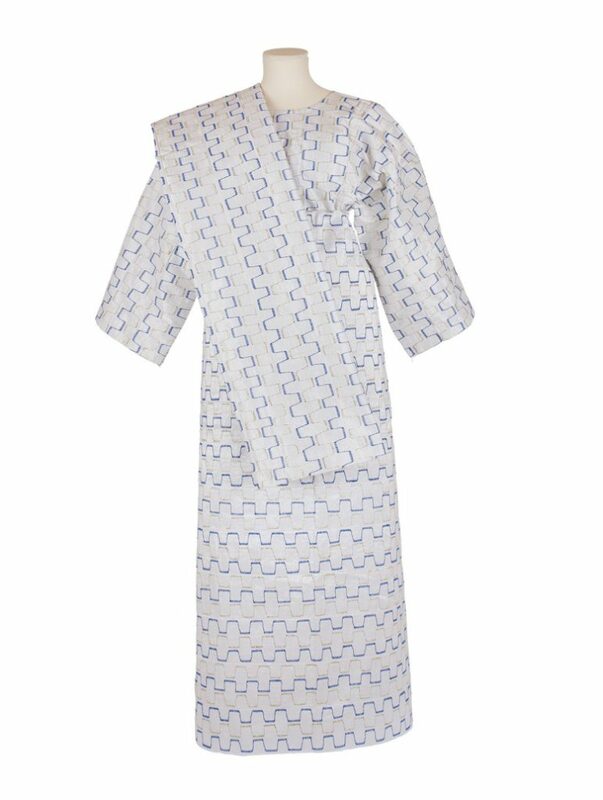 Bride’s aso-oke outfit, 1995. Acquired by Brighton Museum for the Fashioning African project in 2016. ©Royal Pavilion & Museums, Brighton & Hove. Photographer John Reynolds. Groom’s aso-oke outfit, 1995. Acquired by Brighton Museum for the Fashioning African project in 2016. ©Royal Pavilion & Museums, Brighton & Hove. Photographer John Reynolds. An important part of a woman’s aso-oke outfit is the headwrap (gele). The way these headwraps are worn and tied changes over time with the fashions, and tying a gele is a real skill. 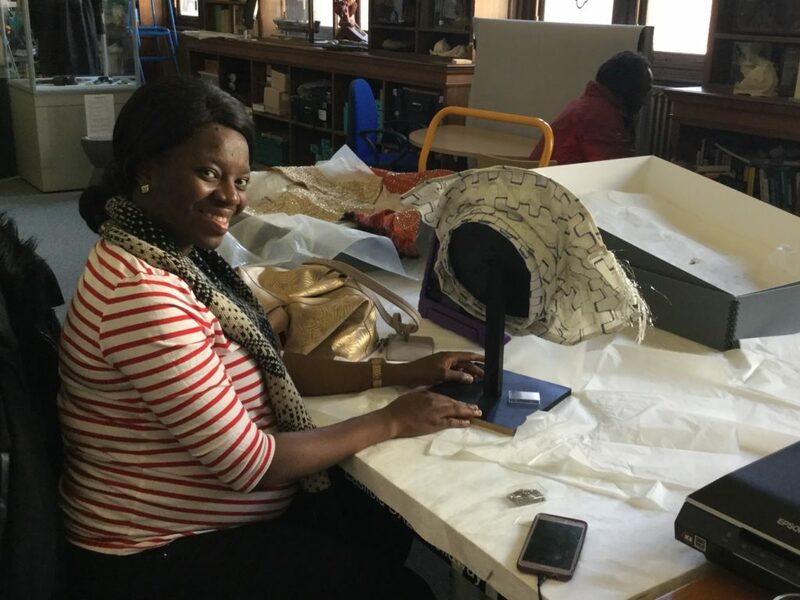 Lorna Eyo a Brighton resident with Yoruba heritage, came into the museum to tie the headwraps for our display, and to demonstrate how to tie a gele as part of Edith’s film. 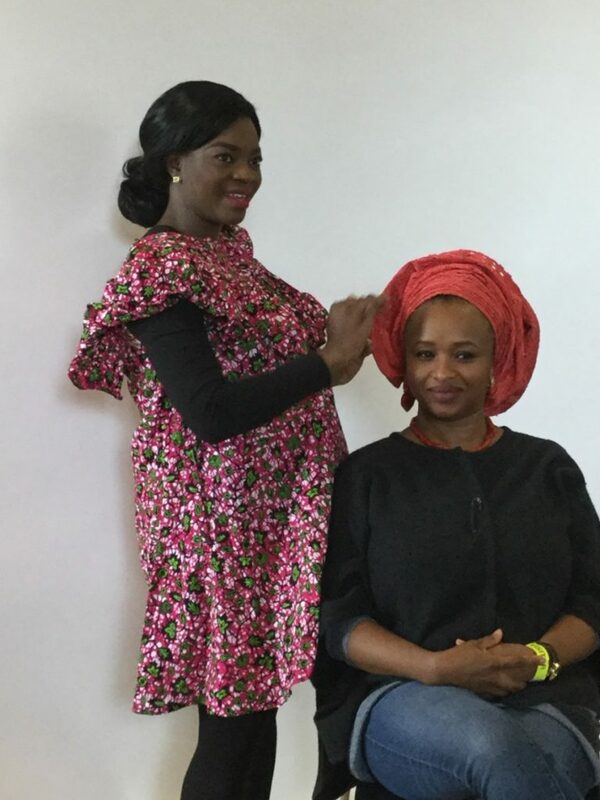 Lorno Eyo, demonstrating how to tie a contemporary style gele headwrap on Edith Ojo, 2018. ©Royal Pavilion & Museums, Brighton & Hove. 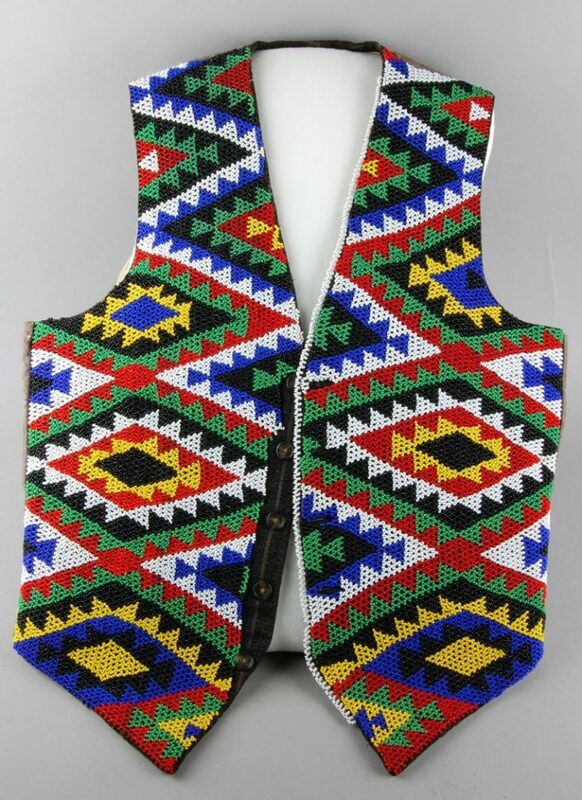 Western style waistcoat adapted with Zulu style beadwork, 1950-1987. The British Museum collection, on loan to Brighton Museum ©The British Museum. 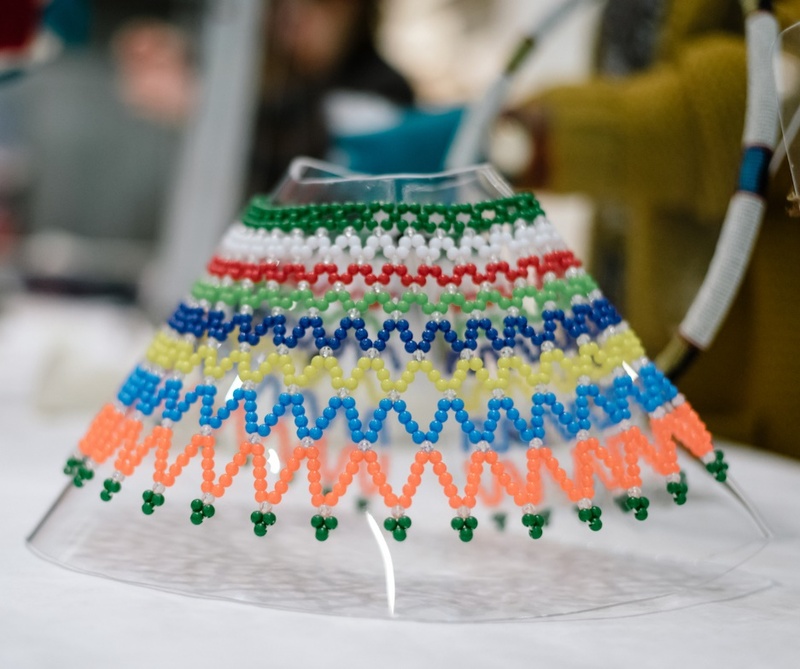 Beaded collar representing ‘pan South African’ identity, 2012. ©Royal Pavilion & Museums, Brighton & Hove. Photographer James Pike. 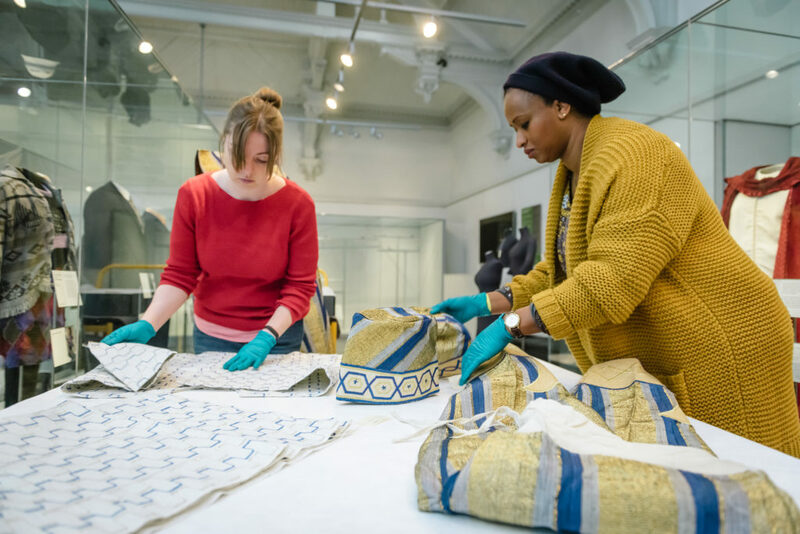 Kathleen Lawther, Fashioning Africa project collections staff member, and Edith prepare aso-oke outfits for display, 2018. ©Royal Pavilion & Museums, Brighton & Hove. Photographer James Pike. Edith and Tshepo worked with the museum staff on all stages of the exhibition, from conception to installation. 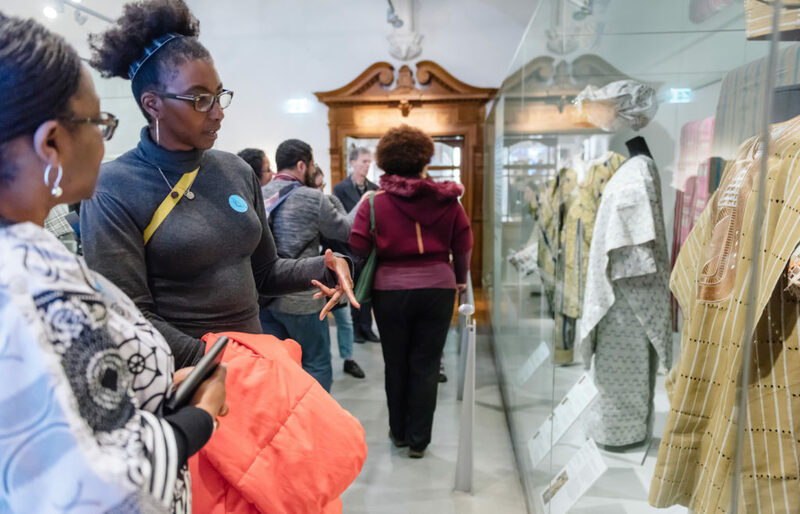 Choosing objects that spoke to their themes, and objects that demonstrated multiple narratives about aso-oke style and evolution, and South African cultural fusion and dialogue through fashion and dress. Edith dresses an aso-oke outfit on a mannequin, for the Aso-oke display, 2018. ©Royal Pavilion & Museums, Brighton & Hove. Photographer James Pike. Rachel and Edith dress an aso-oke outfit on a mannequin, for the Aso-oke display, 2018. ©Royal Pavilion & Museums, Brighton & Hove. Photographer James Pike. 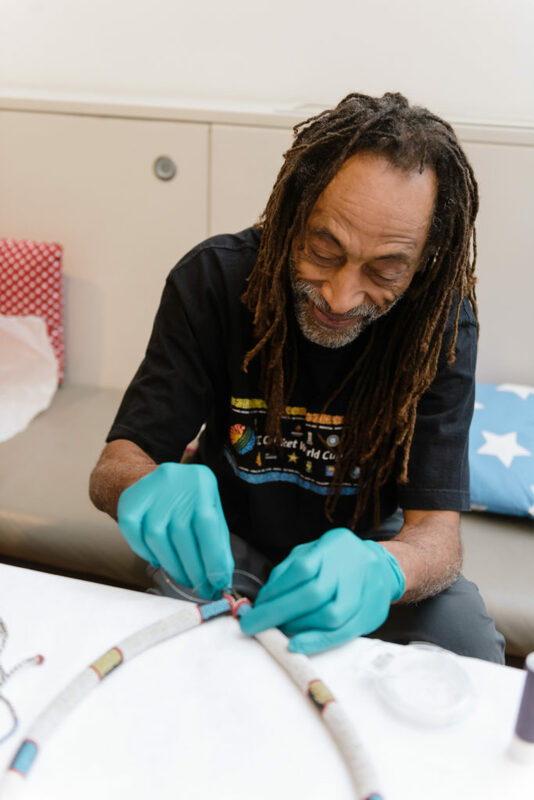 Tshepo and Jamie Robinson, Textiles Conservator from Zenzie Tinker Conservation, fix a beaded collar onto a mount for the Township Journeys display. 2018. ©Royal Pavilion & Museums, Brighton & Hove. Photographer James Pike. 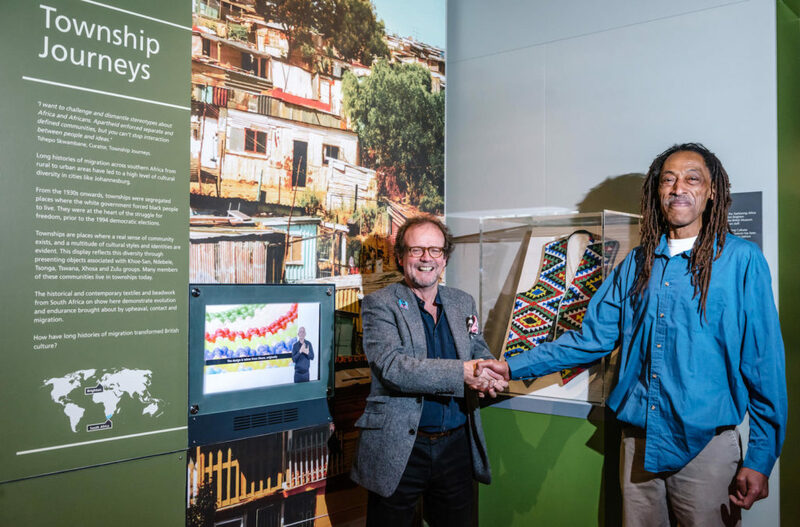 Tshepo installs a beaded collar, Township Journeys display. 2018. ©Royal Pavilion & Museums, Brighton & Hove. Photographer James Pike. Tshepo secures a beaded collar ready for mounting, Township Journeys display. 2018. ©Royal Pavilion & Museums, Brighton & Hove. Photographer James Pike. 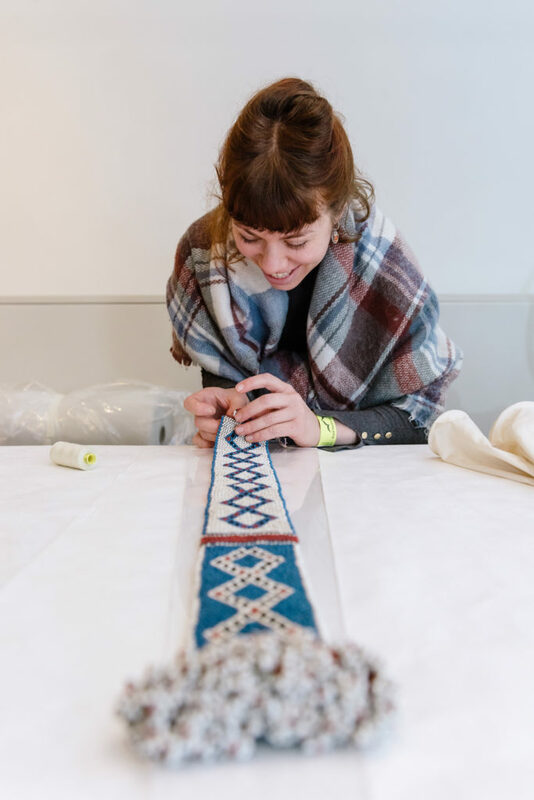 Jamie fixes a beaded collar onto a mount for the Township Journeys display. 2018. ©Royal Pavilion & Museums, Brighton & Hove. Photographer James Pike. 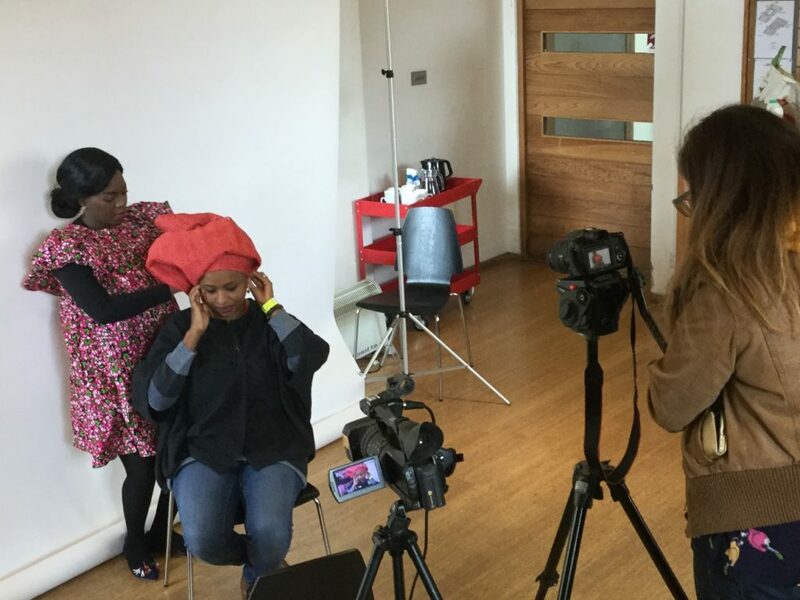 Filmmaker Alice Ross films Lorna Eyo tying a gele headwrap on Edith for the Aso-oke a celebration of style film, 2018. ©Royal Pavilion & Museums, Brighton & Hove. Still from Tshepo’s ‘Township Journeys’ film. 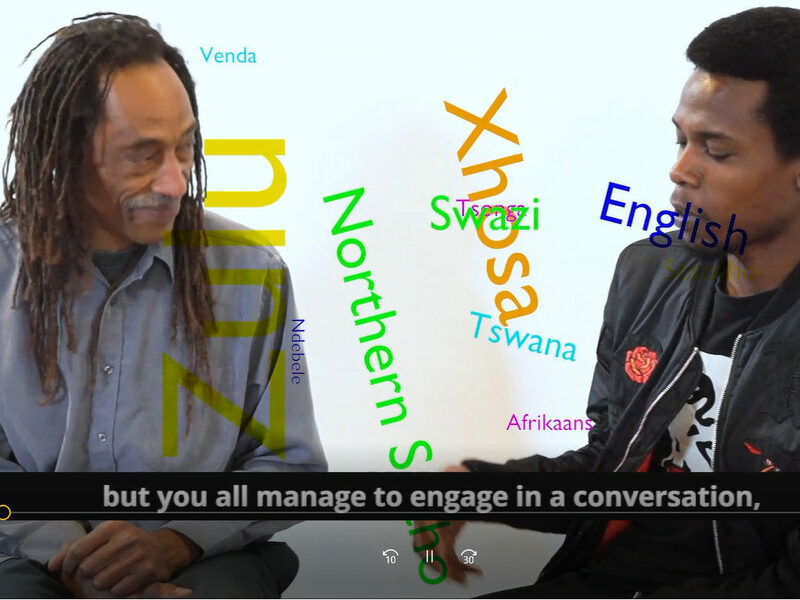 Tshepo and local resident Derick Ncube discuss growing up in a South African township. Film maker Alice Ross, 2018. ©Royal Pavilion & Museums, Brighton & Hove. The Opening: The displays opened on 31st March 2018, and the museum held a celebratory event to mark the occasion. Dr.Chris Spring, Curator of South, East and contemporary African collections opened the displays, Dr.Spring was our British Museum partner curator for the project, who Edith and Tshepo built up a good relationship with over the project. 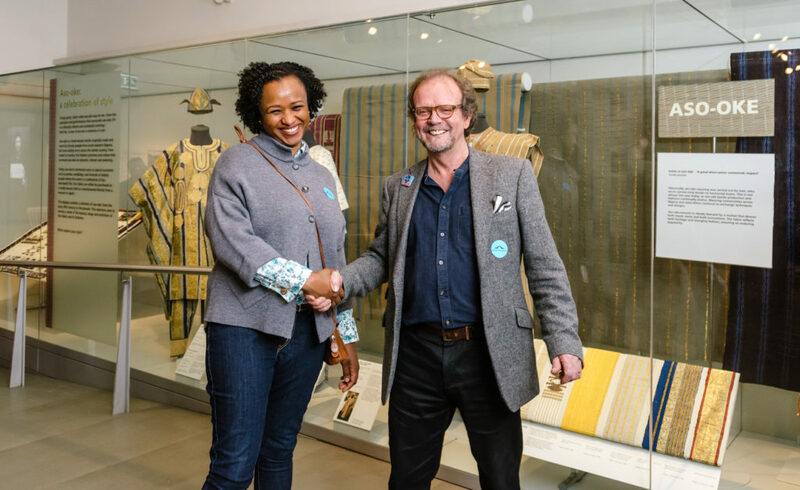 The event was attended by friends and family, members from the Fashioning Africa collecting panel, Africa diaspora object donors, members of the museums BME Heritage Group and partners form the Arts Council, regional museums and the British Museum. 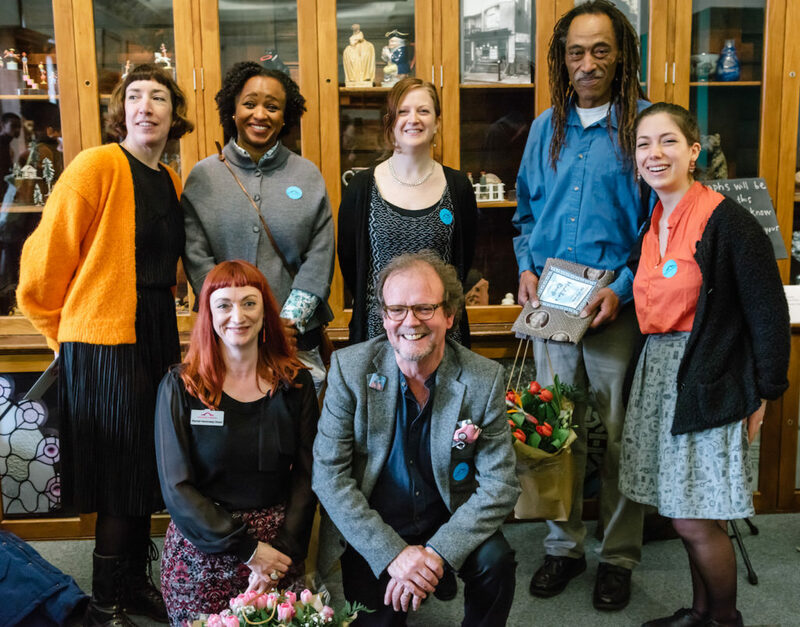 Brighton Museum and British Museum staff and partners at the opening of the displays, March 2018. From left top: Helen. 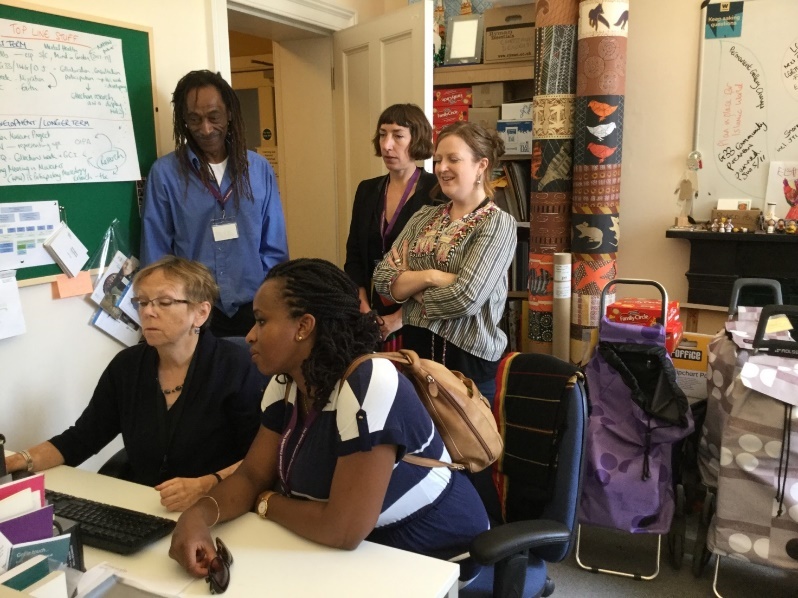 M, Edith, Kayte, Tshepo, Lucia Cortelli [Community coordinator, British Museum], Chris and Rachel. ©Royal Pavilion & Museums, Brighton & Hove. Photographer James Pike. 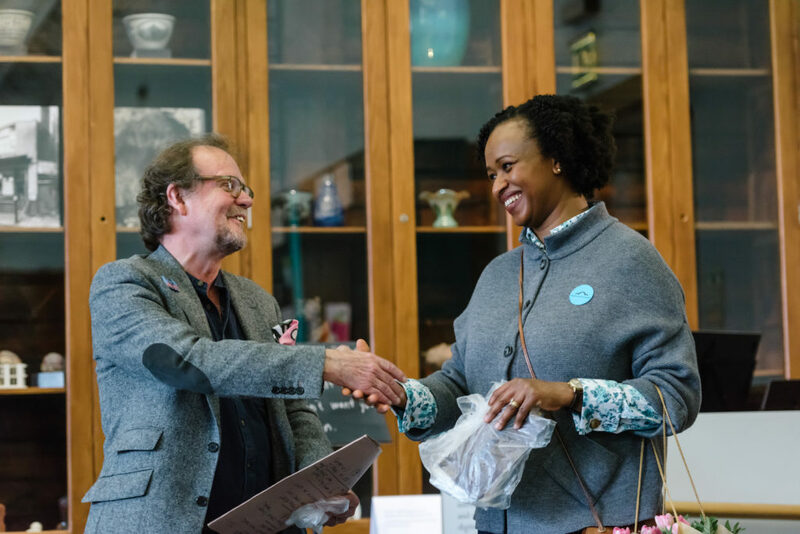 Chris and Edith at the opening of the displays, March 2018. ©Royal Pavilion & Museums, Brighton & Hove. Photographer James Pike. 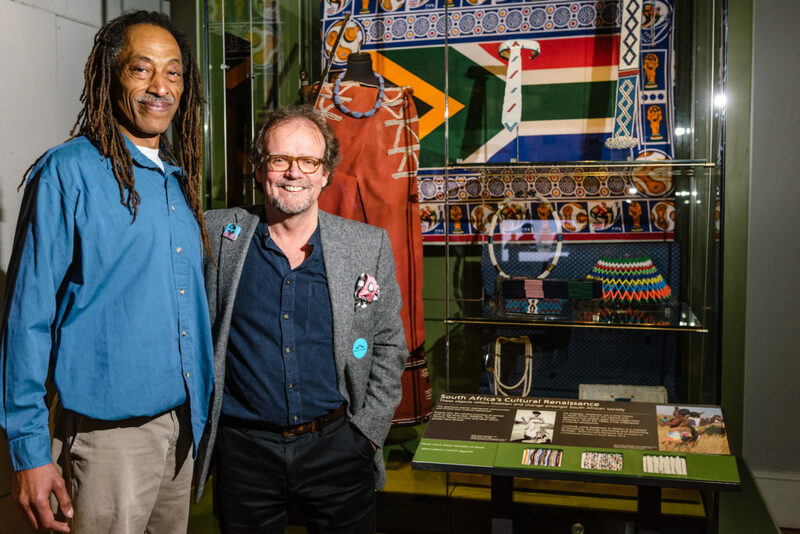 Chris and Tshepo at the opening of the displays, March 2018. ©Royal Pavilion & Museums, Brighton & Hove. Photographer James Pike. Guests explore the aso-oke displays. March 2018. ©Royal Pavilion & Museums, Brighton & Hove. Photographer James Pike. 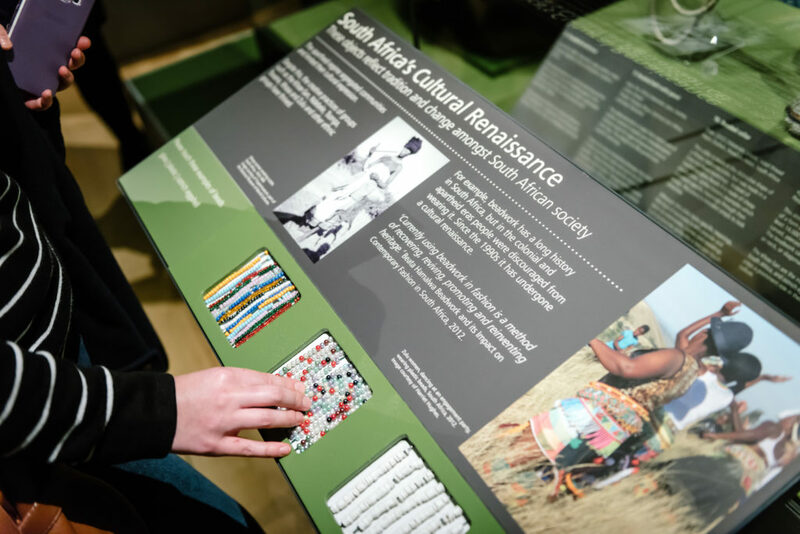 Visitors explore the Township Journeys bead interactive panel. March 2018. ©Royal Pavilion & Museums, Brighton & Hove. Photographer James Pike. 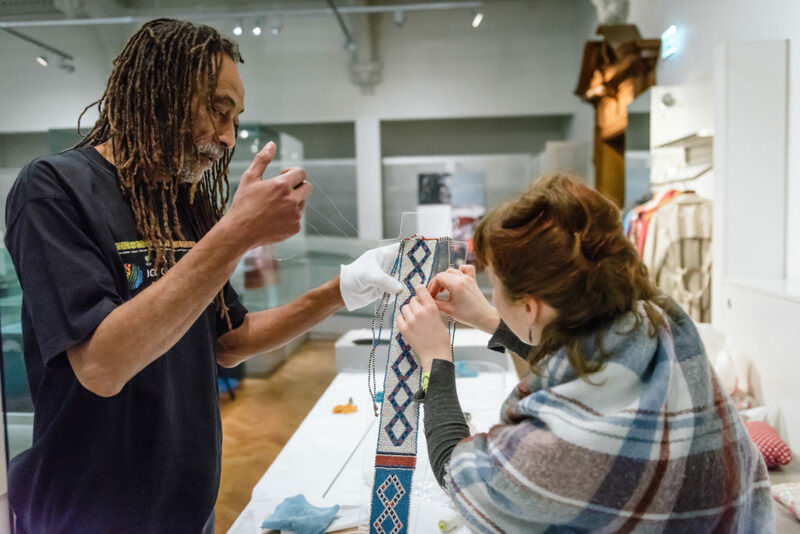 Fashioning Africa is a Heritage Lottery Fund Collecting Cultures project. 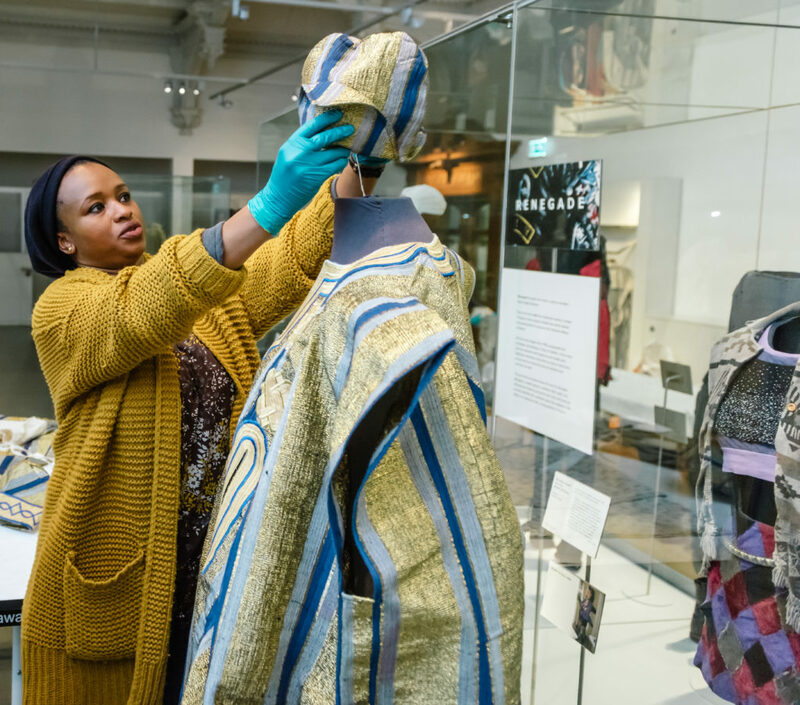 With the support of a collecting panel, Brighton Museum has been able to acquire new objects that reflect post-1960 African fashion identities.This display is part of Object Journeys, a national programme run by the British Museum and supported by the Heritage Lottery Fund. 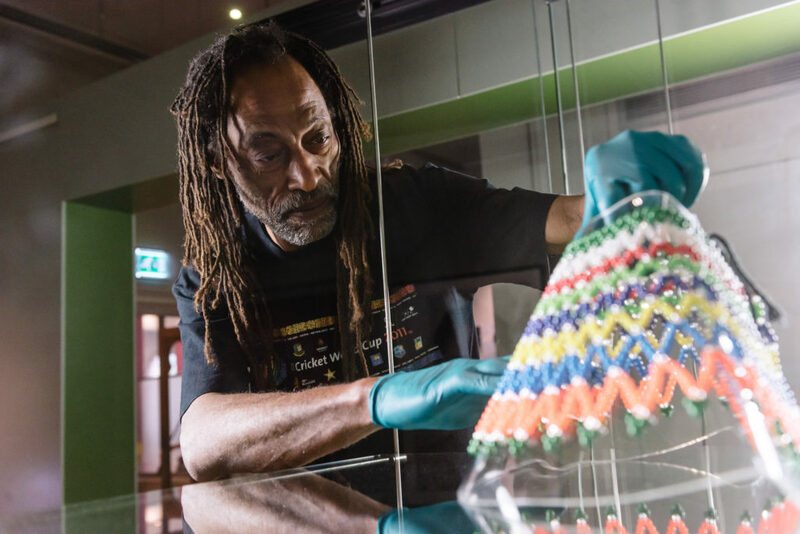 It supports community partners to research and explore museum collections and create new displays in response to this investigation. The displays are open until the end of March 2019. More of this needs to be done to focus on the different cultural richness that is yet to be revealed to the Western world African customs and cultures should be promoted and catalogued for future generations prosperity.